Arsenal make the trip to Naples for the second leg of their Europa League quarter-final tie against Napoli. The Gunners hold a 2-0 advantage from the first leg at the Emirates but they still face a testing challenge, considering their woes on the road this term. 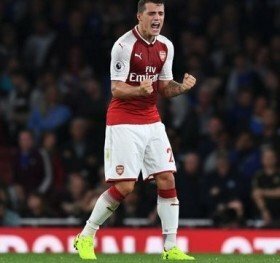 Inter Milan are reportedly understood to be weighing up a summer move for Arsenal's Granit Xhaka as they seek to strengthen their midfield ranks ahead of next season. Arsenal will be aiming to return to winning ways when they welcome Serie A side Napoli for the first leg of the Europa League quarter-final tonight. Arsenal manager Unai Emery has confirmed that the club could miss the services of both Laurent Koscielny and Granit Xhaka for the midweek Europa League clash against Napoli. Arsenal will be aiming to propel to the third position in the standings when they face Everton on the road in tomorrow's early league kickoff. Arsenal have the opportunity to return to the top four of the league standings when they entertain Newcastle United at the Emirates Stadium on Monday night. Arsenal entertain Rennes at the Emirates Stadium in the second leg of the Europa League round of 16 stage tomorrow. Arsenal manager Unai Emery has indicated that the Gunners don't face an easy ride in the top-four pursuit despite their 2-0 win over Manchester United on Sunday. Arsenal have the opportunity to return to winning ways when they entertain fierce rivals Manchester United in the Premier League tomorrow. Arsenal make the trip to Rennes for the first leg of the Europa League round of 16 on Thursday. Arsenal can secure a fourth league win on the trot when they face north London rivals Tottenham Hotspur on the road this weekend. Arsenal will be aiming to secure a third-straight league win when they welcome Bournemouth to the Emirates Stadium on Wednesday night. Arsenal are at the Emirates Stadium for the second leg of their Europa League round of 32 tie against BATE Borisov. The north London side suffered a shock 1-0 defeat at the Borisov Arena earlier this month and they now face a must-win situation to progress further in the competition. Arsenal make the trip to Belarus to face BATE Borisov in the opening leg of the Europa League round of 32. The Gunners have a good history against their opponents after having scored a minimum of four goals in both of the group stage meetings last season. Arsenal have the opportunity to secure a third-straight league win when they face title-chasing Manchester City at the Etihad Stadium on Sunday. Arsenal are scheduled to host Manchester United in the fourth round of the FA Cup on Friday night. Arsenal are scheduled to face Chelsea in the weekend's Premier League encounter at the Emirates Stadium. The Gunners are currently six points behind the Blues, who are occupying the final Champions League spot but they have the opportunity to close the deficit with a victory. Arsenal have the opportunity to return to winning ways when they face an in-form Liverpool side on the road on Saturday. The Gunners are currently just two points behind the top-four positions but they have a testing challenge against the Reds, who are on an eight-match winning league run. Arsenal have the chance to extend their unbeaten run to 21 matches when they entertain Huddersfield Town at the Emirates Stadium on Saturday.